"Did Howard Pyle teach or endorse a particular palette of colors? He was so methodical and analytical, I believe he had an ideal palette underlying his methods. Yet I find no printed evidence." Offhand I didn't know the answer, so I reached out to my lifelines. "It is my understanding that Pyle's emphasis was always on values, and color was of secondary consideration. 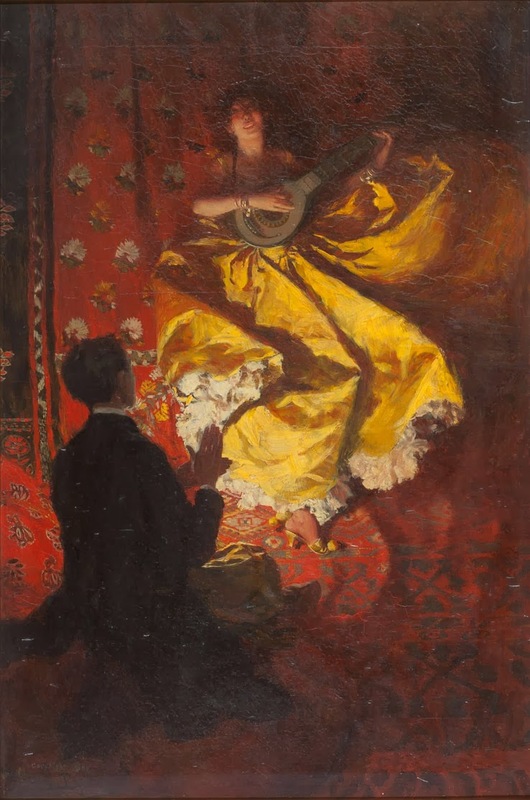 [Harvey] Dunn said that Pyle 'preached tonal values 24-7' and had a very negative view of his own abilities with color. In fact Dunn reported that Pyle claimed he didn't really understand color at all. Given the many beautiful pictures in color by Pyle, we may take this anecdote with a grain of salt... something Dunn said which was designed more to drive home to his own students the preeminence of values in picture making. "Regarding actual palette set up, Harvey Dunn said that Pyle taught his students to 'Keep shadows and light absolutely separate both on palette and on picture.' Dunn elaborated elsewhere: 'Keep light colors and shadow colors separate on palette, shadow colors on left, leaving a division between, and then light colors on the right.'" "I have almost nothing to add to what Kevin said. In my transcribed records, there’s little mention of the specific pigments Pyle used. "And two observers assumed that Pyle added vermillion to his black and whites (starting in the early/mid 1890s). Likewise, an 1897 news item said, 'He even uses color sparingly where that will add to the ‘value’ of his scheme. Black and red is his favorite combination, with the introduction now and then of blue and yellow.'" 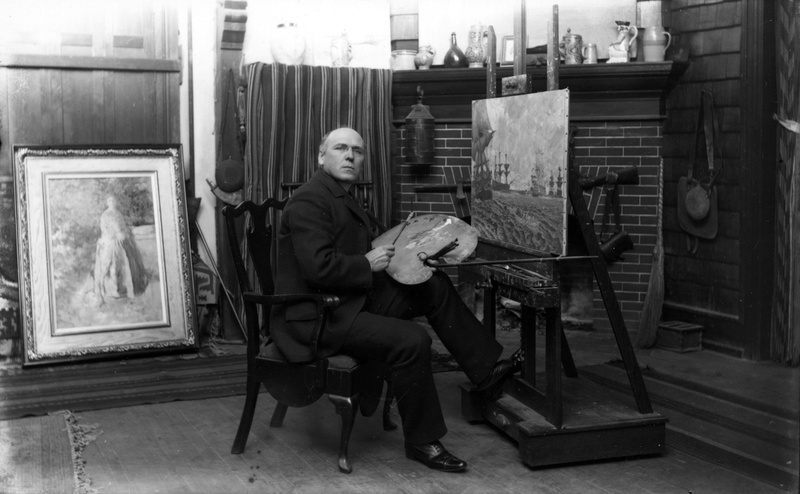 "Like Kevin said, there are a few photos of Pyle with palette in hand - and I think only one (from early 1899 - above) shows the paint side - but that doesn’t help much." Thanks for posting this. I have always been a huge fan of Pyle and his students N.C. Wyeth and Stanley Arthurs. Pyle's "Battle of Nashville" mural is in our Minnesota state capitol and I have spent many an hour admiring it. A few steps away, Arthur's "Third Minnesota entering Little Rock" is masterful. The emphasis on value makes perfect sense, and I only wish I could take it more strongly to heart. My work would vastly improve. He seemed to work during the dawn of color reproduction so the red and black palette was common. I also love the pthalo green and cad red of The Nation Makers, revolutionary war soldiers marching into battle. He seems to pull a full gamut from just the two pigments. "Values, values, values" sounds like a fine mantra to me. I adore colour, but regard myself as hopeless at it too. Very good restricted palette that a local artist uses to great effect is the Hammershoi oil palette. Titanium white, Naples yellow, yellow ochre, burnt sienna, cobalt blue and ivory black. I interpret this as "Keep the colours simple and focus on the values." What's impressive about Howard Pyle is his composition. A lot of artists totally ignore good composition or use it subtly. Frazetta, Wyeth, Alphonse Mucha, Boris Vallejo and Mark Silvestri excel at composition. Pyle was also good at it. I guess their main goal is simplification. Sometimes they use too little background though. The Pr-Raphaelites had good composition and filled up their backgrounds with sharp detail yet they didn't fill every inch with "things". A lot of artists I think ignore composition altogether yet have great composition. I think bad composition is caused by too little understanding of it while spending too much time on it. The more time you spend on prelims the more likely you are to create an unnatural situation in which every area of the picture has own little subject. That's how you layout a magazine page or a comic book page but it's not going to be a good composition. Real life objects don't arrange themselves in the world so that they all take up every inch of your view equally. It's so easy to fill every square inch of a canvas with it's own little subject. The longer you spend on it the more you will want to put something into that blank area. Having said that I did buy Glory Lane primarily for the cover art. In that case it gave a feeling of being in a mall which I was in at the time and I really have a lot of fond mall memories. Besides that people shouldn't always follow the rules especially in art. There would be no Pre-Raphaelites or Impressionists if they did. Modern art though is just people following the bandwagon of "originality". I should probably do some modern art though. I think realism is probably the best training for abstract art.